Drip. Drip. Drip. More facts emerged today in the Obama Administration's payoff of $400 million in hard cold cash to the Mullahs of Iran for the release of U.S. prisoners being held in that radical Islamist country. Now we have learned top officials at the Justice Department reportedly objected to the deal, warning Obama and Kerry that the "optics" were terrible and would appear to the public to be a violation of longstanding U.S. policy not to pay ransoms. Just as important, we also know that Iran believed the payment was in fact a ransom. When you think about it, what they believed is all that matters - not the Obama Administration's "spin" on the story. If Iran thought seizing innocent U.S. citizens would result in Iran receiving $400 million from the U.S. then they will be encouraged to take additional "hostages," which is exactly what they have done in recent months. But never fear! Hillary Clinton will clean up the mess if she wins in 97 days. [Sarcasm] Yesterday, Hillary had already activated her lie button. "This is old news," she said. She added, "We already knew about this in January." From emails to Benghazi to Iran, Hillary's strategy is always the same - deception and bald-face lies. Sadly, with a compliant media, it seems to work for her. A Somali man went on a knife attack rampage in London last night. An American woman in her 60s was stabbed to death. Five other people suffered wounds. The newly elected Muslim mayor of London urged citizens to remain calm. British authorities today said they believe the attack was due to mental illness. But radical Islam is a form of mental derangement. They also point out that he did not scream the jihadist "signature" slogan "Allah Akbar" (Allah is the greatest). Okay. But when attackers do shout it out while killing us, the same "authorities" caution that "the motive for the attack isn't clear." Finally, police add that they can't find any evidence that the man was "recently radicalized." I am just a layman, but wouldn't it be fair to suggest that his stabbing spree is the evidence of his recent radicalization? It looks like spontaneous jihadism. By the way, knives have been the jihadist weapon of choice in Israel over the last year along with ice picks and axes. In addition last night's attack took place in Russell Square, one of the sites in 2005 where jihadists killed 52 people. Coincidence? I doubt it. My advice to Londoners - Ignore your mayor and don't remain calm. Donald Trump met with six Gold Star families Wednesday night ahead of a rally in Jacksonville. But I doubt you heard about it in the mainstream media, which is still obsessing over the Khizr Khan controversy. I guess the only Gold Star families that matter to Big Media are the Muslim ones. The families sat down with Trump for about 30 minutes, relaying their concerns about national security. Karen Vaughn, the mother of a Navy SEAL who was killed in action, set up the meeting, which was attended by 10 family members of fallen soldiers. Afterwards, Vaughn said, "It was really a chance to tell our stories, but also talk about problems with the rules of engagement (for troops in war zones) and the failed policies of the current administration. I walked out feeling like I understood where his heart is, regardless of the comments that he made that may seem insensitive to some." Everyone knows about Khizr Khan, but why isn't Mrs. Vaughn a media celebrity? She gave a moving speech at the Republican National Convention and in 2012 launched a charity to benefit the children of troops who die on the battlefield. But Big Media never talks about her. Vaughn raised an important issue. Why does the United States not win wars anymore? There are many reasons, of course, but an important one is that we follow the rules of engagement preferred by the editorial board of the New York Times and the politically correct crowd. This must end, and we know it won't if Hillary is elected. Many conservatives are frustrated by the lack of discipline that Trump has shown during the campaign. But please don't lose sight of the role that the media play in perpetuating stories that hurt Trump and stifling those that might help him, like his meeting yesterday with Gold Star families. 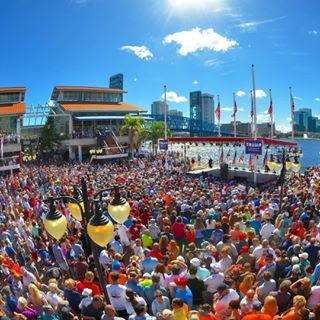 By the way, did you know that the Jacksonville rally was attended by an estimated 16,000 people? Of course you didn't, because the media didn't report it. "Be gone, Satan." Those were the words Jacques Hamel uttered moments before his throat was slit by two jihadists at his church in northern France last week. Father Hamel's final words were revealed at a memorial service for him Tuesday. During his homily for Hamel, Archbishop Dominique Lebrun told the thousands of people who had gathered to mourn the priest, including some Muslims, "You who are tormented by diabolical violence, you who are drawn to kill by a demonic, murderous madness, pray to God to free you from the devil's grip. We pray for you, we pray to Jesus who healed all those who were under the power of evil." At a separate memorial for Father Hamel, another priest compared the god worshipped by Islamic terrorists to Moloch, an ancient pagan god of death. "Those who wrap themselves in the trappings of religion to mask their deadly project," he said, "Those who want to announce to us a God of death, a Moloch that would rejoice at the death of a man and promise paradise to those who kill while invoking him, these cannot expect humanity to yield to their delusion." Yesterday, we expressed concern that Pope Francis does not seem to comprehend the true nature of Islamic terrorism. Here we should be reassured that there are still priests and bishops who understand the Satanic nature of the enemy we face. Tags: Gary Bauer, Campaign for Working Families, Paying Ransom To Thugs, London Terror, Trump Meets Gold Star Families, Jacksonville, FL, rally. Memorial Service For French Priest To share or post to your site, click on "Post Link". Please mention / link to the ARRA News Service. and "Like" Facebook Page - Thanks!